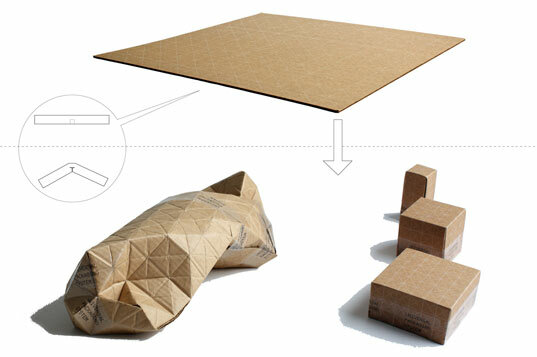 Excessive packaging is one of our top pet peeves here at Inhabitat, so we were really inspired by this flat cardboard sheet that is capable of conforming to the shape of any object, saving a bundle on wasteful filler. Designed by Patrick Sung, the packaging design concept features triangulated perforations that allow it to bend around odd forms. This could also save on fuel for shipping, since all of that wasted box filler is eliminated. We could see how the concept would not be the most practical for all applications, but it could be really great for mailing a surprise gift to a friend! Soft items like clothing or shoes, or even products that are rigid, like a funky reusable water bottle, could be perfect for this packaging. 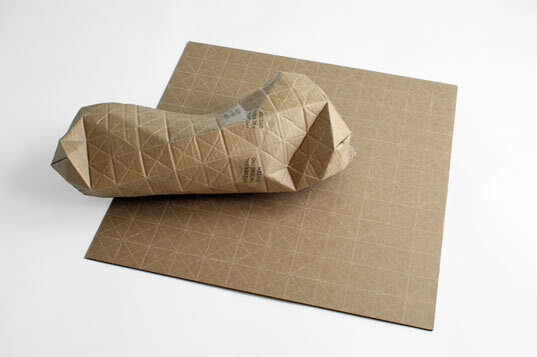 Not to mention that the perforated lines give the package an interesting graphic pattern style. There is something to be said about the efficiency of boxes that stack, which is why it is great that the sheet can also be folded into standard 6-sided boxes. Sung has branded his concept the UPACKS (Universal Packaging System). Although it is not related to the shipping carrier United Parcel Service, the naming likeness could attract some attention for this waste reducing, “inside the box” packaging concept. Greetings! I know this is somewhat off topic but I was wondering which blog platform are you using for this website? I'm getting sick and tired of Wordpress because I've had problems with hackers and I'm looking at alternatives for another platform. I would be fantastic if you could point me in the direction of a good platform. Nokia C5- 06 ( Mobile phone Nokia C5- 06) - an excellent smartphone that runs on S60 5th Edition platform with an ARM 11 600Mhz, equipped with a TFT-screen that displays 16 million colors, with a diagonal of 3.2 " and the camera 2 Mpx, take pictures with a resolution of 1600 x 1200 px. Equipped with a powerful battery at 1000 mAh, which allows the unit to operate up to 600 hours of standby time and up to 11.5 in the talk mode.For the communication has to offer : Web- browser , EDGE, WiFi, stereo Bluetooth, and , of course , USB- port. For music fans there is audio output to 3.5 mm. Also worth noting is that it is equipped with a GPS-receiver , which allows you to find your way anywhere! Man .. Beautiful .. Superb .. I will bookmark your blog and take the feeds alsoI'm happy to seek out numerous useful info right here within the submit, we need develop more strategies on this regard, thanks for sharing. . . . . .
Screw this the future a.k.a. 2015 will have bubbles made with high strength transparent fibers filled with non-conductive, oleophobic and high elasticity gels where we can just stuff our stuff in and not worry about it getting crushed or dirty. It would be easier to pack as well. The only down side? You'll have diff sized bubbles but that is understandable yet practical! I agree with Avions, I think it looks and sounds like a great idea on paper (pardon the pun) but it will make the boxes/packaging a lot weaker so I dont think it would be something you could use on breakable products. I guess it would be ok to use on soft products to post as long as they are sent by a courier that will take care with the packaging, but for breakables I dont think I would want to risk it! I think would rather stick to custom packaging like is offered at www.zeuspackaging.com if I need it. I'm glad that I've found your inhabitat.com web site. Thanks for taking the time to discuss this, I feel strongly about information and love learning more on this. If possible, as you gain expertise, would you mind updating your blog with more information? It is extremely helpful for me. 1800Julien says: "Bubble wrap is easier to use, safer for transport, and has a cool popping sound too. Does this one have a sound?" Does it have a sound? Well, that all depends on what the item that was shipped in it sounds like when it is in little pieces. If it was glass, then it'll have a lot of sound. If it was plastic, not so much. Unfortunately, thin cardboard like this has no protective qualities. It would work for some items if you wrapped them in bubble-wrap prior to wrapping them in this cardboard, but it would be easier to just use a padded shipping envelope for those items. I get what the they were going for here, but it's obvious that the inventor has never worked in the shipping industry. I'm all for smaller packages that need less filler and take up less room on the truck, but they need to provide protection for the contents and this just doesn't. The cardboard in shipping boxes gets all of its strength (and some padding as well) from the corregation. hi everybody I am noob here I recently found this forum from researching several keywords for my school project. I simply wanted to say hi to everybody. Thanks! Bubble wrap is easier to use, safer for transport, and has a cool popping sound too. Does this one have a sound? Hi @Aletalynch! You can email the design [email protected], but I believe this may be just a concept for now! It's interesting that all the naysayers are so sure of themselves when they haven't even touched or worked with the product. From an engineering standpoint, isn't the triangle/pyramid the most stable/strongest shape? Anywhere you would fold would basically result in a triangle/pyramidal shape. And if you still want a box, you still got it. I can imagine a lot of uses for it and I have even used cardboard in this manner after much wrestling and creasing to get the same effect. Although odd-sized packages c/b certainly problematic in a UPS-like situation, there are others where it would work perfectly where a box wouldn't fit into a round hole, etc. I think the product is quite innovative and shows a lot of promise. This is awesome! Maybe the info is here already, but I'm not seeing where you can purchase this cardboard. Can someone share a link? Thanks!! I am not an expert in the terminology of the business, but it seams like the rigidity of acute corners of boxes and the corrugations form the strength and stackability of these containers. Finally is the address location and the load order in trucks etc. These containers would seem to add the phrase "watermelon seed squirt" to the shipping business. This product sure won't ship everything, but anything non-breakable would be fine, and this is far better than the padded envelope. Why is it better - petroleum! A padded envelope is plastic bubble in a plastic or paper bag. This is just the bag (essentially). These don't get loaded on a truck to roll around, they get put in big box on the truck (like cardboard tubes, or any other irregular package. I think it's worth the weight savings. If this only safely packs 30% of all shipped items then its still a win for recyclability, weight reduction and material reduction. Good job, I like your content. Very interesting. It's a novel idea, but I'll have to agree with the nay-sayers on this one. I'm all for green innovation but it needs to be practical too. The packaging may not stand up to rough handling and what more, someone could irrationally attempt to wrap up a breakable object in this packaging under the illusion that it'll be fine. I'd instead try to encourage people to think of new ways to re-use the excessive packaging material that comes with shipments or even just to encourage them to recycle them. Myself I recently ordered a laptop which shipped in a box six times the size of the laptop packaging itself with nearly three meters worth of brown paper padding stuffed in the box itself. I'm planning to use the brown paper as christmas gift wrapping and decorate the paper with my own designs. The box will go to storage and be used as a packing box for when I need to move. And if I get sick of the brown paper lying around, I'll recycle it. Not to beat a dead horse but this is mostly useless for packaging and I think is less environmentally friendly than a regular box. At least an "excessive packaging" box can be reused (storage, other shipping needs, etc). As also pointed out, won't do much to protect the item during transport. If you have a non-breakable item that this could be used for, it's going to be a lot quicker, cheaper, etc to stick it in a plastic/tyvek mailer bag or padded envelope. It might have other useful applications but not in shipping. We have a reusable, recyclable container which replicates an industry standard cardboard box but folds flat for return - great for importation of garments. Basically it has all the benefits of cardboard and because if folds down to 25mm thickness it makes it cost effective to return in a sea container back to the Far East for refilling. We think it will be good for 20 trips before having to be recycled. The dialogue that has been started here is great! I'm excited to see that the concept has sparked your green wheels in motion. I also worked as a structural packing designer for the POP industry - in other words, a cardboard box designer. I think that is why this project caught my attention. It breaks the rules! It is valid to say that the concept might not hold up to traditional ideas for packaging engineering, and that shipping carriers may not be too happy with organic shaped boxes, but I want to point out that it is thought provoking concept. I love some of the brainstorming that some of you have mentioned - craft projects, gift wrapping, building blocks...its great! Also to Dr Hound, I wonder why excessive packaging you not be seen as a pet peeve? Of course we love to see ideas that focus on reduction of material waste! If anyone finds other examples of sustainable packaging, please send them our way! http://improbable.com/airchives/paperair/volume6/v6i4/postal-6-4.html 64% delivery, and that's on unwrapped packages. I'd think this would be welcome. LOL @ "Why not just wrap your item in newspaper and toss it down an elevator shaft." True. No shipping company or USPS will accept this package. There's a reason packages tend to be flat. wow avions... take it easy. Considering you haven't even seen the product I can't really consider your overly negative opinion... even if you majored in cardboard engineering. how do you know this doesn't stand up compared to corrugated carboard? I agree with Avions and Pmensten. What this "system" does really badly is to make it easier to pack objects, protect the object in shipping and handling, and facilitate ease of shipping. I wouldn't dare send a anything packaged this way the USPS. But what it does very well is create a infinite varieties of forms. What if it was repositioned as free-form containers and vessels, or DIY light-use furniture, or a toy in the vein of Legos, Constux, and Lincoln Logs? Why not just wrap your item in newspaper and toss it down an elevator shaft. Cool product. And contrary to other posters' opinions, I can see some great shipping uses for this. ALSO. look, so you conform every box on a truck. right? all these odd shapes, lamp like, keyboard, whatever it is. you have a TON of odd items. you try and efficiently AND quickly load this truck. it wont work well. novel idea, but what would work better is a box you could fold at many points into a BOX. not a lump. Worst idea ever! And here\'s why: By perforating/creasing the corrugated board, you remove ALL the strength a traditional box provides. Corrugated sheets derive ALL their strength via the CORRUGATIONS (where the packaging material gets its name). Are you form fitting the product? Yes. However, are there better, more environmentally friendly materials, lighter weight materials, less manual labor intensive practices that can accomplish this same task? Yes! If I were Patrick, I would bring this idea to a UPS or FedEx and they would in turn show him just how aggressive a sorting facility will be on this product/package. What qualifies me to speak about this? Because I teach a class on paper and paperboard for Packaging Engineers. Visually, this looks like a cool idea, but in reality it will fail in a big way.